Half Of A Drug's Power Comes From Thinking It Will Work : Shots - Health News Words matter when it comes to medicine. By comparing placebo pills labeled as migraine medicine with medicine labeled placebos, doctors figured out that half of the pain relief of medication comes from a person's belief in its effectiveness. "There was no difference between the pharmacology of the drug in reducing pain and the placebo dressed up with a nice word," study author Ted Kaptchuk tells Shots. "Basically we show that words can actually double the effect of a drug. That's pretty impressive." And if it works when treating migraine headaches, it also might work for a wide variety of other ailments, from asthma to intestinal cramps to back pain, that involve the subjective experience of symptoms. The findings, in this week's Science Translational Medicine, have interesting implications for doctors and patients, because what physicians say about a medication appears to have a lot to do with its benefits. The study is the latest in a series that's helping to decipher the mysteries of the placebo effect. The research is conducted at a newly established Program in Placebo Studies and Therapeutic Encounter at Beth Israel Deaconess Medical Center and other Boston hospitals. People reported changes in migraine pain after they were given an effective medication called Maxalt or a placebo pill. How the pills were labeled made a big difference. No treatment: 15 percent increase in pain. Known placebo: 26 percent decrease. Mystery pill (Maxalt or placebo): 40 percent decrease. Known Maxalt: 40 percent decrease. *Note: These two values are not significantly different statistically. The group has shown: that placebos rival the effect of active medication in patients with asthma; that even when patients know they're taking a placebo, they can get relief from the cramps, bloating and diarrhea of irritable bowel syndrome; and that those subliminal suggestions can activate patients' placebo response. This time, Kaptchuk and colleagues decided to use migraines to untangle the placebo component of patients' expectations. "Migraine is ideal," Kaptchuk says. "I can't think of another instance in which a real disease happens and then disappears, and then comes back." That allowed the group to test patients' responses against themselves, by watching what happened during seven successive migraine attacks in 66 subjects — 495 attacks in all. Another advantage is that there's an effective drug, rizatriptan or Maxalt, that has been shown to work better than placebo pills. The researchers asked all of their subjects to refrain from taking any medication for two hours after the onset of their first migraine. Then they were given six envelopes, each containing a pill to be taken during their next six migraine attacks. Two of the envelopes were labeled "Maxalt." 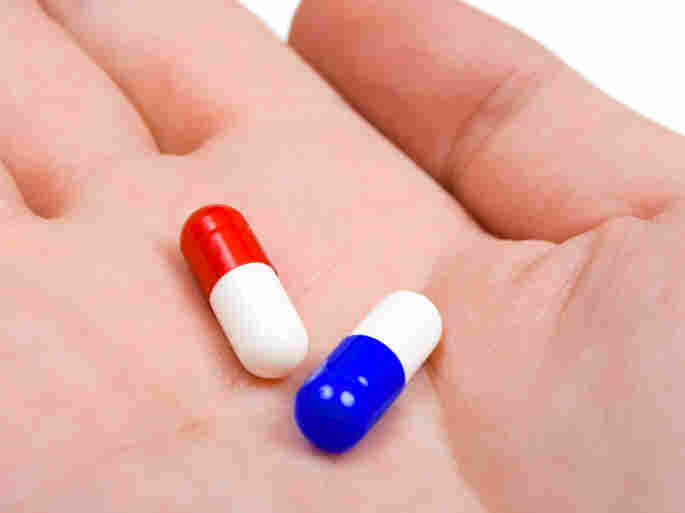 Two indicated that the pill inside could be either Maxalt or a placebo. And two were labeled "placebo." Subjects rated their amount of pain two hours after taking each pill. When subjects took no pills, they reported a 15 percent increase in migraine pain after two hours. When they took a placebo that was accurately labeled, they reported 26 percent less pain. When they took a Maxalt pill that was properly labeled, they reported 40 percent less pain. And when they took a mystery pill that could have been either a placebo or Maxalt, they also reported a 40 percent decrease in pain. When subjects took Maxalt that was labeled as placebo, their decrease in pain was statistically no different than when they took a placebo labeled as Maxalt. "We were surprised that the efficacy of Maxalt mislabeled as placebo was not significantly better than the efficacy of placebo mislabeled as Maxalt," the researchers write. One striking thing in the findings is the power of uncertainty. Patients had just as much pain relief when they weren't sure whether an envelope contained Maxalt or a placebo. "There's something going on here that we don't understand," Kaptchuk says. "But I think uncertainty engages you in a different way." It might be analogous, he says, to how doubt can increase the faith of a religious person — it may strengthen the desire to believe. Kaptchuk says a doctor's (or researcher's) manner or words had no effect because patients were only influenced by the words on the pill-containing envelopes. "What's exciting is that all we did is change one or two words on an envelope," the Harvard researcher says. "There was no doctor-patient interaction after the first meeting." But in one significant way the placebo didn't beat the real drug. When the researchers asked patients if they were totally pain-free 2 1/2 hours after taking the pills, patients said Maxalt was almost four times better — 25.5 percent versus 6.6 percent. That's consistent with previous placebo studies, Kaptchuk says. For instance, the asthma study showed that asthma inhalants open patients' airways while placebos don't. But placebo inhalers reduce patients' perceived symptoms of asthma. Being free of migraine pain is a yes/no question, whereas there's more "wiggle room" in being asked if pain is lessened. "That's a judgment call," Kaptchuk says. "Being pain-free is not a judgment call." Kaptchuk says the results shouldn't be seen as undermining the effectiveness of Maxalt. "It's a really good drug. If I had migraines, I'd take this drug, too," he says. "But I'd want a physician to understand that every word counts."